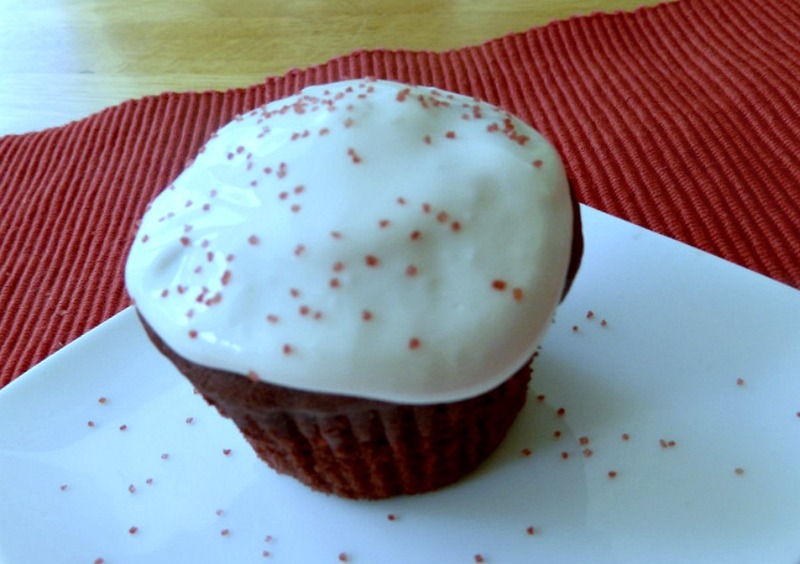 These Red Velvet cupcakes are so easy to make and taste totally amazing! Bake a batch up and bite into deliciousness! This is such an easy recipe, and beyond delish! I can’t believe it but these taste like the full fat cupcakes that you get in the bakery but they are not! 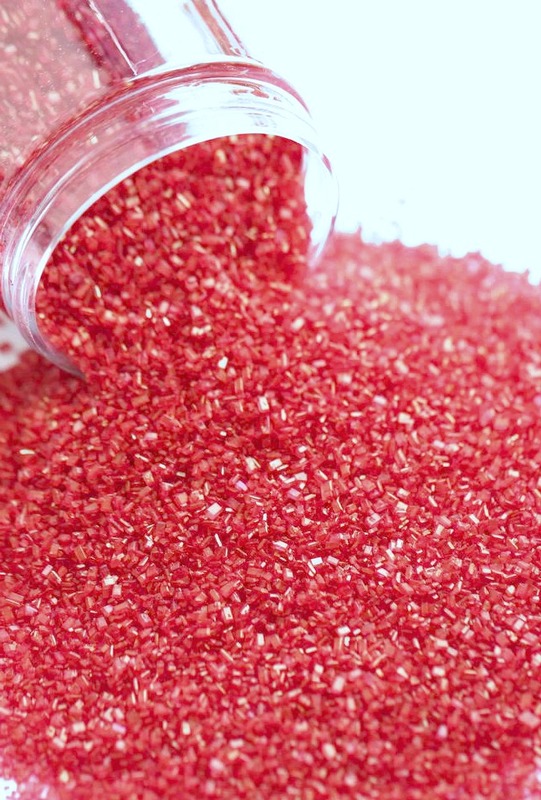 Check out the easy-peasy recipe on how I was able to bring down the fat and calories and still produce the moist delicious red velvet cupcake we all know and love. Using a cake mix is just great. Always comes out just perfect. You’re going to go wild for the creamy marshmallow frosting too. These are the most requested dessert to bring for family gatherings, parties and pot luck dinners. Even great for picnics, just make sure you put them in a cupcake holder. Prepare the frosting, mix all ingredients except the sprinkles with an electric mixer until smooth. Place covered in fridge for at least 2 hours. before starting the batter. Preheat oven to 350 degrees. Have foil liners ready in cupcake pan. Mist cooking spray into the cups. Set aside. Mix ingredients in the order that is listed. Mix with a wooden spoon or rubber spatula until all ingredients are combined. With an electric mixer, beat about 1 – 2 minutes until light and fluffy. Pour into cupcake pan 3/4 full. Bake about 14-16 minutes until wooden toothpick comes out clean. Let cool completely. Once the cupcakes are cool, frost with a thin layer and top with sprinkles. Everyone's favorite cupcake made so simply with a cake mix. 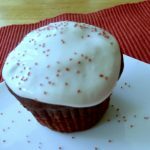 Add a few ingredients and you have the most delicious, moist red velvet cupcake with the fluffiest marshmallow frosting. Enjoy! 1.Prepare the frosting, mix all ingredients except the sprinkles with an electric mixer until smooth. Place covered in fridge for at least 2 hours. before starting the batter. 2.Preheat oven to 350 degrees. Have foil liners ready in cupcake pan. Mist cooking spray into the cups. Set aside. 3.Mix ingredients in the order that is listed. Mix with a wooden spoon or rubber spatula until all ingredients are combined. With an electric mixer, beat about 1 – 2 minutes until light and fluffy. 4.Pour into cupcake pan 3/4 full. 5.Bake about 14-16 minutes until wooden toothpick comes out clean. Let cool completely. 6.Once the cupcakes are cool, frost with a thin layer and top with sprinkles. Take a big bite, yum! !